Libra April 2017 Horoscope forecasts that this will be a balanced month. Your job is to handle professional issues, domestic problems and psychological matters with necessary importance. Success depends on your ability to solve the various obstacles properly and promptly in April 2017. The April 2017 Mercury retrograde will affect your activities during the month. You should reduce the pace of your work during those days. Socially this will be a very active month for the Libra zodiac sign. While you make some new contacts, you will lose some. You will be more dynamic and will try to improve your intellectual capabilities. Planetary influences will force you to seek the assistance of others to achieve your goals. This is not the time to be independent and arrogant, Libra. Compromise and teamwork are necessary in April 2017. The April 2017 Libra monthly astrology predictions forecast that the Lunar Eclipse will affect your professional prospects over a long period. This is a period to be cautious when it comes to business dealings, Libra. The 2017 monthly horoscope predict that financial plans for the Libra personality too are under review in April 2017. You can improve your monetary situation by making the required changes in your financial strategies. The zodiac 2017 forecasts suggest that the Libra finances depend on their social connections. You can enhance your money prospects by partying and socializing with influential people. Your spouse, government, investors too will boost your finances in April 2017. Trading in stocks and shares will give good returns. You can make money by becoming a share broker and by helping others to become richer. April 2017 will bring out the various flaws in your present love partnerships and friendships, Libra. In the end, these relationships will emerge stronger. Strong marriages will endure and weaker ones will be discarded. Pregnancy will need to be planned after some thought. Love will be more natural and physical for the Libra personality in April 2017. Singles will fall into love swiftly and with ease. Your search for your right partner might end this month. The April 2017 horoscope for Libra zodiac forecasts that there is a need to have enough relaxation to keep you fit. Conserve your energy by working on essential things and postponing the less important matters. You can seek the help of others to share your responsibilities. You can improve your health by proper exercise. Foods like carrot, banana, eggs and ghee in your diet will boost your energy. 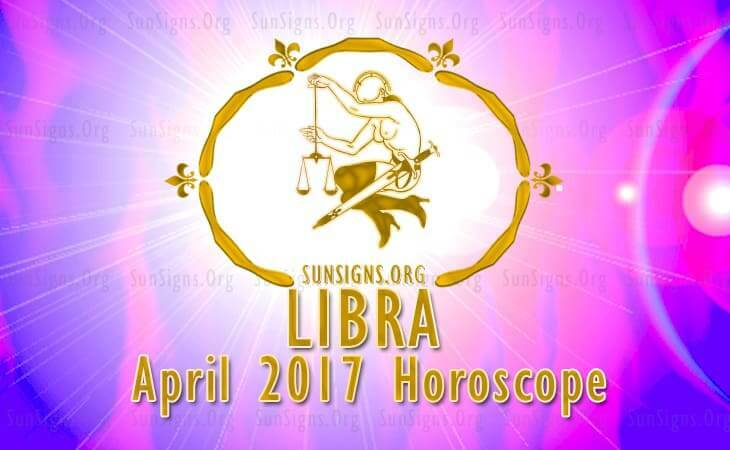 The Libra horoscope for April 2017 shows that all problems in your job or love life will be brought to the forefront this month.